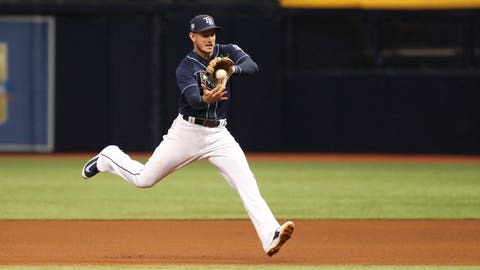 ST. PETERSBURG, Fla. (AP) — Tampa Bay Rays infielder Daniel Robertson has been put on the 10-day disabled list with a sprained left thumb and might miss the rest of the season. Robertson was hurt sliding into second base on a double Friday night. He will see a hand specialist Sunday to determine if surgery will be required. “In all likelihood it’s going to be a significant amount of time, we’re talking six to eight weeks,” Rays manager Kevin Cash said Saturday. Robertson is hitting .262 with nine homers, 34 RBIs and has a .382 on-base percentage in 88 games. Tampa Bay purchased the contract of infielder/outfielder Brandon Lowe from Triple-A Durham. After hitting 16 homers in his first two minor league season, he has gone deep a combined 22 times this season between Double-A Montgomery (8) and Durham (14). Lowe, with a smile, credited “eating to-go apple sauces” with his power surge. “That kind of sparked it all,” Lowe said. Cash said Lowe will probably start Sunday in left field. “Impacting the baseball like that, it’s hard not be noticed,” Cash said.